There’s been plenty written about why the South suffered so much from this week’s surprise snowstorm. But there’s really only one thing to blame: those cold lumps of steel that are still abandoned on the side of the highway. What happened in Atlanta could happen any time, any place where people rely so heavily on cars. What we now know is that it wasn’t the snow that paralyzed Atlanta. It wasn’t even the fact that a storm, that everyone thought would blow a gentle dusting of powdered sugar over the city, actually threw down a metropolitan-area sized sheet of black ice instead. The problem was that all of the city’s drivers decided to get on the road at the exact same time to try to get home—each driver also most likely driving alone in their own car. 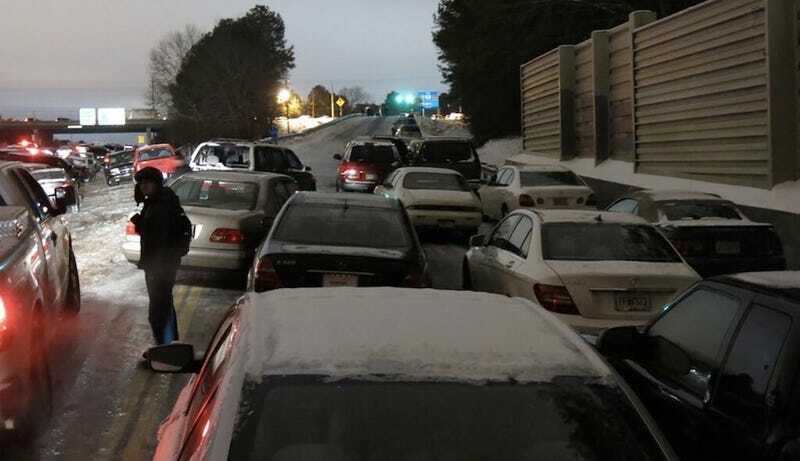 The 24 hours of region-wide gridlock that ensued, and the nightmarish stories that came from it, had absolutely nothing to do with Atlanta or salt trucks or even winter weather. This could have happened in any city that gets shaken by an emergency in the middle of the workday. Any city, that is, where cars are the only viable way to get around. People driving home from work—because they can’t take public transit to the office. Parents driving to schools to pick up their kids—because their kids don’t walk to school. People driving to a grocery store—because they aren’t able to fulfill their daily needs on foot. This is what caused the problem in Atlanta. But this scenario wouldn’t look much different in most American cities. What happened in Atlanta especially terrifies me because I live in Los Angeles. All I could think when looking at the photos is that this will be L.A. when the big one hits, only here it will be even worse. The Northridge earthquake, which was epicentered in the San Fernando Valley of L.A., happened on January 17, 1994 at 4:31 a.m. The reason that only 57 people died in the 6.7 quake is because most Angelenos were at home, in bed. And that’s also the only reason we didn’t have the same post-disaster gridlock, which would have wreaked havoc on the emergency services and likely caused even more deaths. Last week, as L.A. acknowledged the 20th anniversary of Northridge, I found myself paging through photo galleries of the aftermath. There was one thing I kept spotting among the images of twisted rebar and crumbled stucco: People riding bicycles. A bike is probably the single most important emergency preparedness item you can have. Especially when it’s a week after the earthquake and there’s nowhere to get gas. How we’d get home in an ice storm or buy water after an earthquake or get to work after a flood is not something we think about as we buy our houses, choose our schools, and zip around strip malls in our SUVs. But it needs to be. It’s not that we have to spend every day preparing for the looming disaster ahead. But we have to demand these simple things from our cities—better sidewalks, safe bike lanes, reliable transit—that give us options when we need them. We need to design our cities with our very worst days in mind. Hopefully this is the wakeup call that Atlanta needs to push itself to the next level when it comes to transit and walkability. But the Atlantas of the world should be looking at the photos of that gridlock, the red dots of brake lights stretching out into infinity, and then taking a long, hard look at themselves.